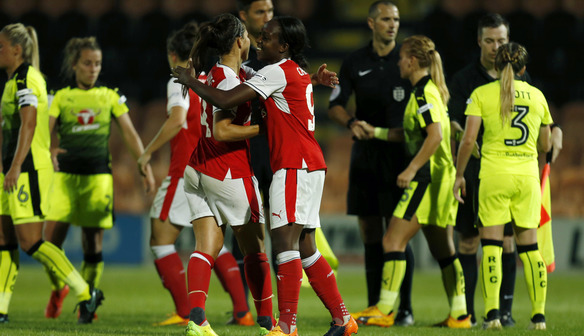 Arsenal’s title hopes are still on track after they saw off a stubborn Reading 1-0 in a closely-fought game at The Hive thanks to Danielle Carter’s goal. The forward’s one goal was enough to keep their unbeaten FA Women’s Super League 1 Spring Series campaign in tact ahead of the weekend’s final fixtures. Arsenal went close after 15 minutes but Beth Mead’s effort struck the post and they remained frustrated as Mead, Jordan Nobbs and Leah Williamson all went close shortly after. However, five minutes before half time they went ahead as Mead combined with Hannah O'Reilly down the left, with the latter reaching the byline and squaring the ball across the box to the unmarked Carter, who tapped home. Both sides began the second hald with the bit between their teeth but as Reading searched for the equaliser, Arsenal went close with Danielle Van de Donk firing wide. As the game sparked into life Nobbs again went close for Arsenal and Reading goalkeeper Mary Earps then palmed away a fierce Fara Williams drive. The Royals then went even closer when Lauren Bruton's volley from the edge of the box went inches wide, but Carter's goal was enough as Arsenal climbed up to third in the table. To buy tickets to an FA Women’s Super League match near you, click here. "I think overall it was a good performance. "We should have scored more goals in the first half especially, and in the second half we were a bit more defensive. "But, we also take that as a positive because it shows as a team we can change our game to suit the situation, and to make sure that we get all three points and secure the win. "It wasn't because we were nervous, the manager gives us the instructions on how to play and how to defend, and that's the best way to deal with the scenario we are in. "We followed that and we executed it well and managed to get the three points." "I think we've been unlucky really, we worked really hard and fought very well. "We brought in a few different players for this game and I think it shows what we are building here, that they all came in and played really well. "We have been building all season, that was the message from the manager and the staff that we just wanted to build this Spring Series, and I think we have done that. "I think we should have got on the score sheet today and we are disappointed that we didn't, but we can take confidence from the game, that we gave them a really good game and hopefully we can take that forwards into next season."